After having a lot of fun with binoculars on Mount Baldy last week, Brian and I resolved to get back out with scopes before the moon got too bright to observe anything else. We went up last night with both my 6″ and 10″ scopes. Normally I don’t let houseguests escape without a look at the top 2 or 3 things in the sky, whether they’re in from across the country or just across town, so Brian has looked through both of my big scopes before. But that’s from town, when I was driving the scope, and we’d never been out for a proper telescope observing run before last night. We got both scopes set up in a nice spot just a little after 9:00 PM. At his request, Brian was driving the XT6 and I was manning the XT10 . 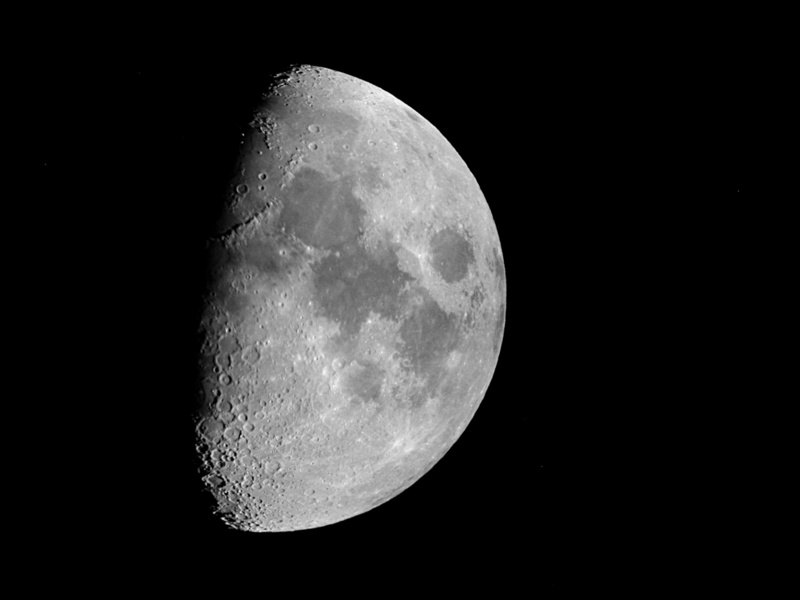 We started out on the first quarter moon, which looked pretty darned good. We were still getting solid images at 200x, which means the seeing was very good by urban SoCal standards (even though we were on the mountain, to view the moon we were looking south over the Inland Empire). Brian got an MS in geology before switching to biology for his PhD, and he immediately recognized the Alpine Valley (the laser-straight valley near the bottom center in the image below) as a fault. After that we cruised through the best and brightest between Scorpio and Aquila–M7, M6, M25, M22, and so on up to M11, the Wild Duck Cluster. This was familiar territory for us both since we’d just been over it with binoculars less than a week before. This time we had a lot of additional aperture and magnification on our side, but we were also fighting the moon, which was swamping out a lot of the fainter stars and nebulosity on deep sky objects to the south. To fight the moonlight we turned west to take in the globular clusters M13 and M5. From a dark site I think the smaller but more compact M5 gives M13 strong competition, but by the time we got there M5 was pretty low in the sky, and about twice as close to the moon as M13, so it wasn’t even close. M5 still looked acceptable, but M13 looked great. We had a look at M57, the Ring Nebula, which was a big glowing doughnut at 200x in the 10″. We also got a clean split on Epsilon Lyrae, the Double Double star, which is always cool. Both scopes have the horsepower to do that split pretty easily, if the atmosphere cooperates. From town it often doesn’t, and I have to settle for a pair of 8s instead of four cleanly separated stars. We finished up in the north, starting with the galaxy trio of M31, M32, and M110. M31, the Andromeda galaxy, has always been a favorite of mine, but the satellite galaxies M32 and M110 have often bedeviled me. After unambiguously identifying them several times in recent weeks–at Big Bear Lake, and now twice on Mount Baldy–I’m getting a lot more confident about recognizing them. And my appreciation of them is growing as I learn more about them. I’m reading The Perfect Machine , by Ronald Florence, about the building of the 200-inch Hale telescope on Palomar Mountain, and I just learned that M32 was the first external galaxy resolved (split into its constituent stars) all the way to its core by astronomers. That was done by Walter Baade using the 100-inch telescope at Mount Wilson, during World War II. In my 10″ scope M32 is nothing more than a bright glow, and having been to Mount Wilson a couple of times I can certainly appreciate the achievement in resolving it completely using one of the great iron and plate glass leviathans of the early 20th century. I lent Brian a planisphere and a mag 7 star atlas (this one, which is free) and he rocked along with aid or supervision for the most part. In fact, I’ve never seen anyone pick up the use of a telescope and atlas so quickly. By the end of the run he was really feeling his oats. After the Andromeda galaxy trio he picked out a nearby planetary nebula, NGC 7662, more or less at random and suggested we try that next. We even had a little friendly competition to see who would be the first to star-hop to the nebula starting from M31. Brian got to the location of the nebula first, but he couldn’t see it clearly in the 6″ scope. And no wonder–even in the 10″ it was a very compact round glow, like a fat star, at low power, and a slightly bigger but no more detailed glow even at 200x. Not one of the sky’s more breathtaking sights, but we had a fun time getting there. And even when all you can see is a bright dot, there is something arresting about watching the death throes of so great a thing as a star. We finished the observing session on the Double Cluster, going back and forth between the two scopes and trying out a variety of eyepieces to see which would yield the most pleasing view. And after packing up and driving down the mountain, we finished the evening at In-N-Out Burger with some earthbound but equally delicious Double Doubles. Some fine gastronomy to put a cap on an evening of fine astronomy. I worry that might be getting spoiled. 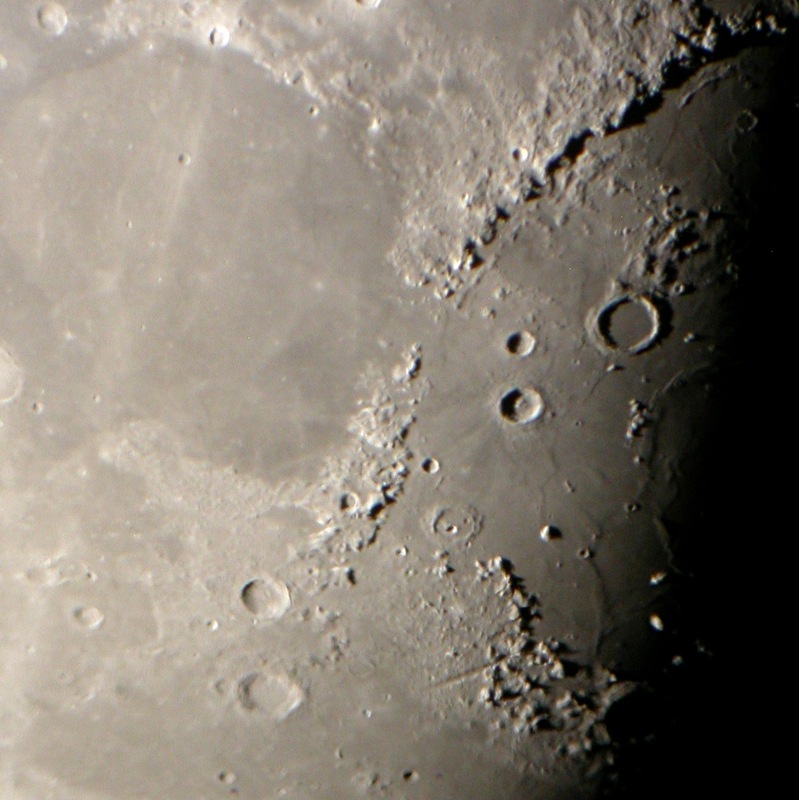 Photos taken with a Nikon Coolpix 4500 digital camera, shooting handheld through an Orion XT10 Dobsonian telescope with Orion Stratus eyepieces. Two things. First, I found out that finding these things is as much fun, if not more, then actually looking at them. Completely different experience. Second, it’s like they put crack in those double-double animal styles.